The Center for Biological and Environmental Nanotechnology (CBEN) conducts research that focuses on nanoscience at the "wet/dry" interface, between nanomaterials and aqueous systems at multiple length scales, including interactions with solvents, biomolecules, cells, whole-organisms, and the environment. 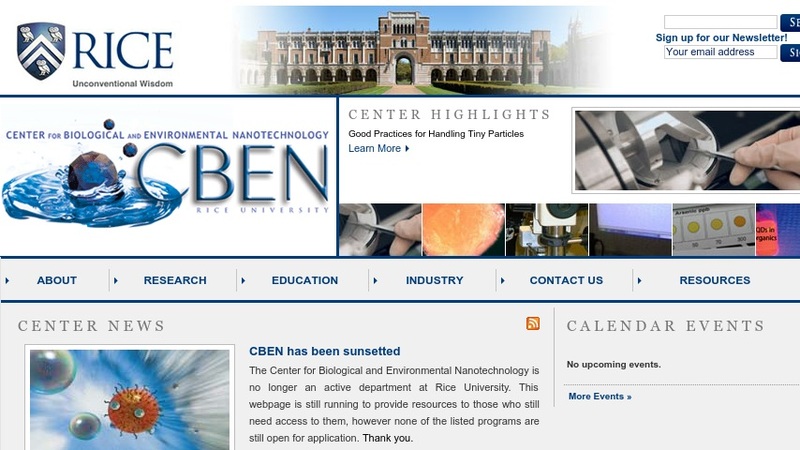 The CBEN website features news articles, event announcements, overviews of research programs, and information on affiliations with industry. The education page provides information on professional development programs for educators, videos and hands-on research experiences for K-12 students, and research opportunities for undergraduate and graduate students.